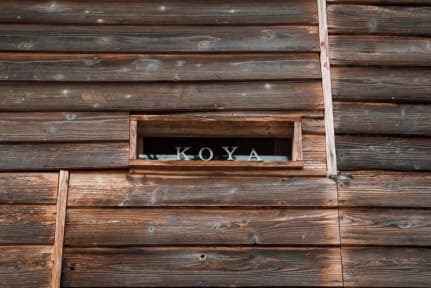 Koya Backpackers is a renovated Japanese traditional style guesthouse at Karuizawamachi in Nagano. Karuizawa is popular tourist destincation for summer vacation. People here are enjoying hiking, tennis, golfs, and forest bathing in the forest. Koya Backpackers is located middle of the way from Karuizawa Station to Kusatsu Hot spring via Mt. Asamayama. Koya Backpackers offers cozy rooms and beds with reasonable price, designed for the backpackers. It is the accommodations where you can stay excluding meals. After check-in, you can take advantage of on-site facilities, which are necessary and sufficient to life, such as sharing space, bathroom, kitchen and roofs. (2) If cancelled or changed from 2 days to the day before the arrival date, 50% of the full balance will be charged. (3) If cancelled or changed on the arrival date or in case of No-Show, 100% of the full balance will be charged. (1) Koya Backpackers accepts over 15 years old in the dormitory rooms. (2) Private room is from 6 years old. 6. Reception Hours: 08:00-11:00; 16:00-21:00. 7. Extra 8% taxes fee is required when check-in. (1) Karuizawa-machi is not allow to 23:00 on and after sales. - Please note Gad and noise until late at night as not lead to inconvenience to the neighborhood. The staff was very welcoming, friendly and helpful! Very good experience. Close to three good onsen (hot springs). If you like the mountain cabin atmosphere, this is a good place. Host is a great guy, very helpful and likes to talk with guests in the evenings. Great value for the money, as well. If I ever make it up that way again, and this place is still open, I'm definitely staying there. 轻井泽真的是太美好了！住在“山里”的日式旧屋也真的是太美好了！来的一天是台风，下雨下的人晕晕沉沉感觉自己变成了“林间小屋”的苏志燮... 但是也多亏了这个第二天放了个大晴，蓝天无论配云场池的水还是群山、瀑布，都给人大大的惊喜。整个town兜下来，真的觉得是在游欧洲小镇，好想在那里生活啊！ 房东挺好的（不过比起亚洲人到底是偏爱欧美人多点），住的第一晚还集合一帮房客做了大阪烧（600yen），然后同住的一对澳大利亚情侣真的很nice，大家有说有笑开心～ 订房的时候看到封面照就几乎没有犹豫，而最终确实没有让人失望。 Besides, for anyone who wants to take the bus, please go for No.1 bus stop (Karuizawa Station), and check the timetable of SK. Do this as the first thing after getting out, as you may miss and wait for an hour for next one. The hostel is an old-school refurbished house located up the street from Naka-karuizawa. Its easier to get around Karuizawa with a car, but there's a number of onsens and restaurants within walking distance. The host was kind and incredibly accomodating to me. Would stay again! The owner Kin-chan is very helpful (introducing the place and offering suggestions and advice) and the place is great! The beds have small curtains to cut off the light and cheap meals are also available. It is also very near a few onsens, as well as many famous places in Karuizawa. Bicycle rental also available. The only drawback is it is not that near to the old Karuizawa downtown. 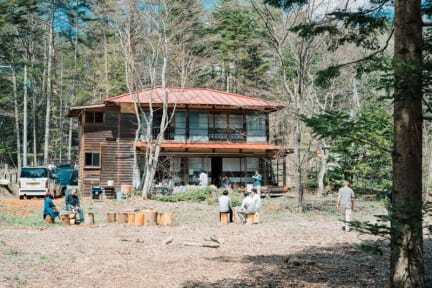 Great hostel with great vibe, really cool owner in quiet, forested area of Karuizawa. Would happily stay again! The location is a bit secluded and quite hard to reach by local transportation. When we arrived, the outside structure of the building and the yard were so much different from the one showed in the web. The inside, though, was very warm and accommodating. With Japanese style living room and the dorm room which were very comfortable. As for the yard, I think it's because we visited in Fall with so much rain. Maybe if it was summer, it will be more like the pictures. The owner was nice and helpful! The hostel has the feel of a Japanese home, and beds are futon in tatami rooms (though this means no privacy). It's in a nice secluded spot in the woods, and there is parking so it's convenient by car. There are some onsen and a small upscale restaurant/shopping complex in walking distance, but options there are limited. There is an 11pm curfew which may be inconvenient for some. But overall it felt like an authentic Karuizawa experience. Connections to sightseeing places aren't that good.